Posted in Bartending, Cocktails, mixology, Recipes . There are certain cocktails that are timeless. When someone orders one, you can picture each ingredient and the exact preparation. You know the glass, the garnish, and whether to shake or stir. One of these classic cocktails is the Old-Fashioned. This iconic drink seriously is old fashioned. In fact, it has been around since the early 1800s when the private social club, Pendennis, was credited for making the very first one. When someone orders an Old-Fashioned, reach for rye whiskey and pour two ounces into a mixing glass. For a sweetener, crush a sugar cube. Then comes two dashes of Angostura Bitters. Finish off the drink with a splash of water and a good stir. Before handing it to your guest, pour the final concoction over a few large ice cubes in a chilled Old Fashioned glass and garnish with an orange peel twist. Since its birth hundreds of years ago, the Old-Fashioned’s components have taken some twists and turns. Some bartenders prefer to use brown sugar, some like to use bourbon instead of rye whiskey, and some garnish with a lemon peel. The Old-Fashioned’s recipe also can vary by geography. In Kentucky, bartenders commonly use bourbon, a muddled cherry and orange, and a splash of soda water. In Wisconsin, Old-Fashioneds are often made with brandy. Although it’s a classic, there’s no reason why we shouldn’t conduct a little cocktail experimentation. With a good idea of the basics, additions and substitutions can make for an exciting new spin on an old favorite for both the mixologist and patron. Here are 10 versions of the classic Old-Fashioned cocktail for you to mix up. Sour cherries might be too tart to eat by themselves, but if you muddle them, and combine them with sugar and whiskey, they’re pretty darn delicious. Mix up this new spin on the classic Old-Fashioned created by Mark Bittman, a columnist for the New York Times Magazine. Usually Old-Fashioneds are made with whiskey, but Ryan Lotz of No. 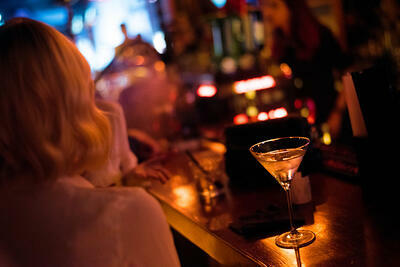 9 Park in Boston likes to mix it up with a cognac variety of brandy for a smooth finish. 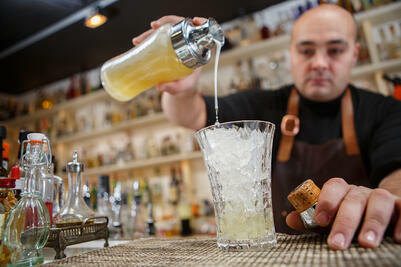 Ryan mastered the art of bartending after graduating from Boston University. He was on the opening team for Jackson Cannon’s, The Hawthorne, before settling in at No. 9 Park. Dustin Knox, the owner of Central in Portland (OR), holds an Old-Fashioned happy hour where he offers 10 different versions of the cocktail. One of his variations is called the Aquavit Old-Fashioned. He finds that Aquavit’s flavor matches well with honey, Angostura, and orange bitters. If you’re looking for something a bit on the saltier side, check out the Experimental Cocktail Club’s Salt Fashioned! For an Autumn-like approach, they add maple syrup and apple bitters to the mix — yum! The Breslin in New York City has their own version of an Old-Fashioned. They’ve decided to give it an apple twist and they call it the Baked Apple Old-Fashioned. The husband and wife co-owners (Brooke Williamson & Nick Roberts) at Playa Provisions, encourage people to experiment and have fun with Old-Fashioneds. They recommend starting with a base spirit and inspire people to change ratios, substitute spirits, and trade out syrups and bitters. One of the new Old-Fashioneds featured at their restaurant is the Desert Rose, made with tequila! The average American eats nearly 18 pounds of bacon a year, so why not add it to a cocktail as well? The Patterson House in Nashville creates a new take on an old cocktail by adding this American favorite. From the River Bar at Sea Island Resort in Georgia, this Old-Fashioned is a little on the sweeter side — with a heaping spoon of Fig Jam! Joaquin Simo, 2012 Bartender of the Year, has a unique idea for an Old-Fashioned. He uses two forms of grapefruit and suggests that you avoid smoky Scotches and go big on the twists. As you can see, the Old-Fashioned has taken some interesting twists and turns since its original creation. It has a rich history with ingredient variations based on region, personal preference, and experimentation. 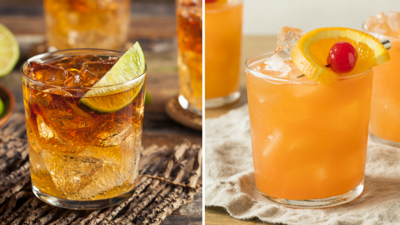 What’s your favorite version of the Old-Fashioned? Do you have your own, unique recipe? Tell us by commenting below. 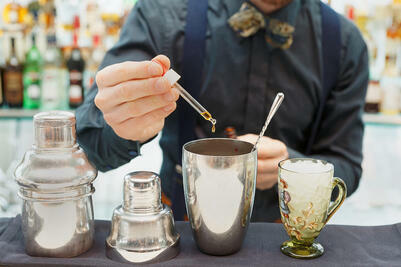 Want to know more about the Old-Fashioned’s glassware? Check out our Cocktail & Spirit Glassware Guide!